The Elbow sleeve provides the therapeutic values of heat retention, compression and support. The high quality support provides comfortable compression to help reduce the pain associated with common elbow injuries such as Tennis and Golfer's Elbow.Provides the therapeutic values of heat retention, compression and support. 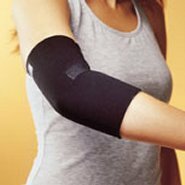 The high quality neoprene retains heat to warm and relax the muscles and tendons helping you regain full elbow movement. The Elbow Sleeve provides comfortable compression to help reduce the pain associated with common elbow injuries such as Tennis and Golfer's Elbow, without limiting range of motion. Made with high quality, closed cell neoprene for great comfort and constructed to last with reinforced seams and capped edges. Medial and Lateral epicondylitis and provides full elbow coverage.